Montepaschi Siena sent a message that echoed all around the Turkish Airlines Euroleague by downing Real Madrid 69-88 in the Spanish capital in Top 16 Group F on Wednesday. Montepaschi improved to 2-0 and became the only undefeated team in Group F, handing Madrid its first Euroleague home loss this season. 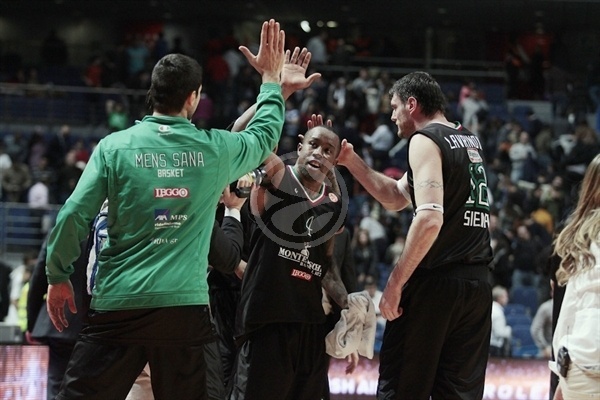 Bo McCalebb paced the winners with 25 points, a new Euroleague career-high, on 9-of-10 two-pointers and 6 assists. Ksistof Lavrinovic added 16 points, David Andersen had 11 while David Moss got 10 for Montepaschi. Felipe Reyes led Madrid with 17 points and 15 rebounds. 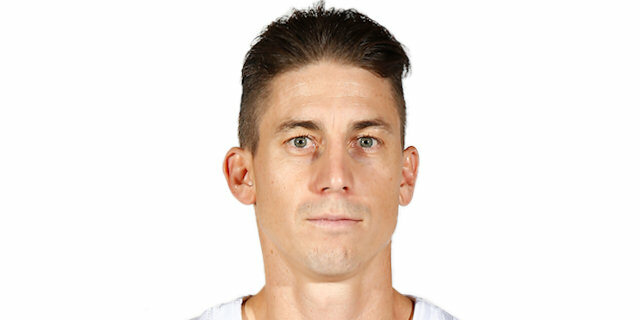 Jaycee Carroll added 12 points for the hosts. A three-pointer by Carroll gave Madrid its last lead, 8-6. Moss and McCalebb fueled a 0-14 run that put Montepaschi ahead for good, 8-20. Montepaschi improved its margin to 15-31 after 10 minutes and then again to 20-40 early in the second quarter. Sergio Llull and Reyes stepped up to bring Madrid within 34-47 at halftime. Nothing changed after the break, as an outstanding McCalebb allowed Montepaschi to get a 48-65 margin at the end of the third quarter and the guests managed to keep a safe margin all the way until the final buzzer. Bootsy Thornton got Montepaschi going with a turnaround jumper that Ante Tomic matched with free throws. 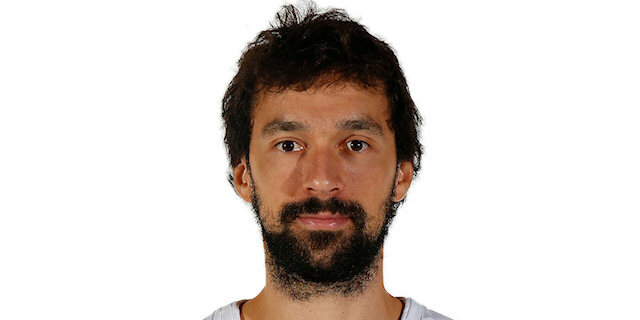 Andrea Michelori shined with a power basket but Nikola Mirotic answered from downtown to give Madrid its first lead, 5-4. Moss shined with a fast break layup that Carroll bettered with a triple, good for a 8-6 score. McCalebb took over with a wild three-point play and soon added a layup to put Montepaschi back ahead, 8-11. Moss finished a patient Montepaschi offense with a three-pointer and a mid-range jumper by Andersen boosted the guests' lead to 8-16. 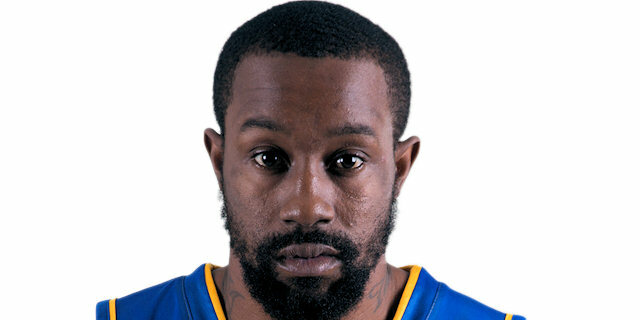 McCalebb stayed on fire with a backdoor layup and free throws by Moss capped a 0-14 Montepaschi run, 8-20. Carroll split free throws and a tip-in by Tomic got the crowd involved at 11-20. Montepaschi did not panic, however, as back-to-back triples by McCalebb and Lavrinovic broke the game open, 11-26. Lavrinovic nailed another three-pointer and a fast break layup by McCalebb kept Montepaschi way ahead, 13-31. Free throws by Felipe Reyes brought Madrid within 15-31 after 10 minutes. Moss fired in his second three-pointer early in the second quarter and Tomas Ress erased Reyes' free throws with a five-meter jumper that restored a 17-36 Montepaschi margin. Carlos Suarez nailed a triple from the right wing but back-to-back driving baskets by Igor Rakocevic made it a 20-point game, 20-40, forcing Madrid to call a much-needed timeout. 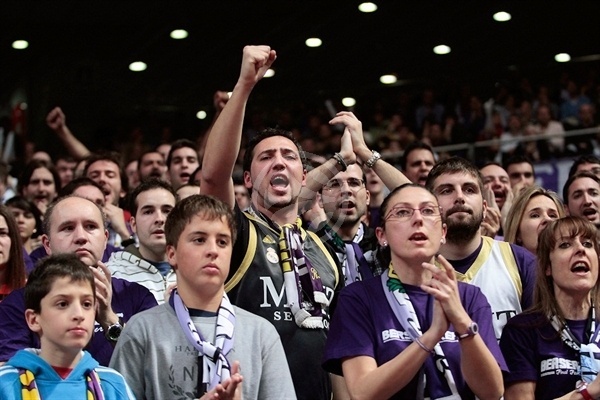 The hosts started to play more aggressive at both ends and Rodriguez tried to ignite Madrid's comeback with free throws. Reyes his his trademark jumper from the top of the key but Rakocevic matched that in the other end. Llull took over with a wild driving layup but a red hot Rakocevic buried a big three-pointers that silenced the crowd at 26-45. Marty Pocius joined the three-point shootout, as Montepaschi had started to struggle to find open shots and could not play defense with the same intensity once it had entered the foul bonus. Reyes shined with a driving basket and a free throw by Llull got the hosts even closer, 32-45. A huge jumper by McCalebb and an acrobatic basket by Kyle Singler fixed the halftime score at 34-47. Montepaschi struggled to score right after the game, as Madrid kept playing with high intensity. Meanwhile, Pocius took over with a reverse layup for a 36-47 Madrid deficit. Andersen shined with a turnaround jumper and Thornton nailed a six-meter shot to boost the guests' lead to 36-51. Montepaschi kept its momentum going, controlling the game through an outstanding McCalebb, whose layup-plus-foul gave his team a 36-54 margin. The guests had improved their defense midway through the third quarter and free throws by Thornton capped a 0-9 run. Carroll followed a jumper with a put-back layup but Thornton quickly scored in transition for a 40-58 score. Reyes hit a jump hook that Lavrinovic bettered with his third three-pointer. Mirza Begic found his first points and Reyes added a put-back basket but an unbelievable basket by McCalebb gave Montepaschi a 46-63 lead. 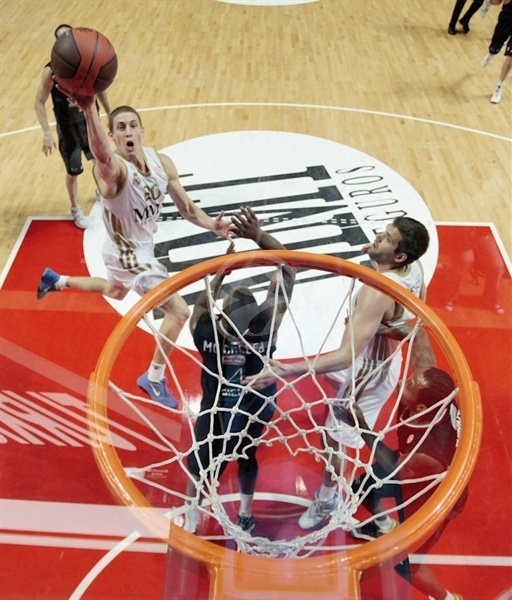 Lavrinovic buried a jumper but a driving layup by Llull kept Madrid within 48-65 after 30 minutes. Lavrinovic struck from downtown early in the fourth quarter but Begic quickly answered with a jump hook. Montepaschi had started to use long possessions to make the most out of lead but started to get tough shots, too. Llull made free throws and a close basket by Reyes got the crowd involved at 54-68. Reyes scored again off a Montepaschi timeout and a driving basket by Carroll brought Madrid as close as 58-68, after a 10-0 run. Lavrinovic gave the guests some fresh air with free throws that Mirotic erased with a five-meter jumper. 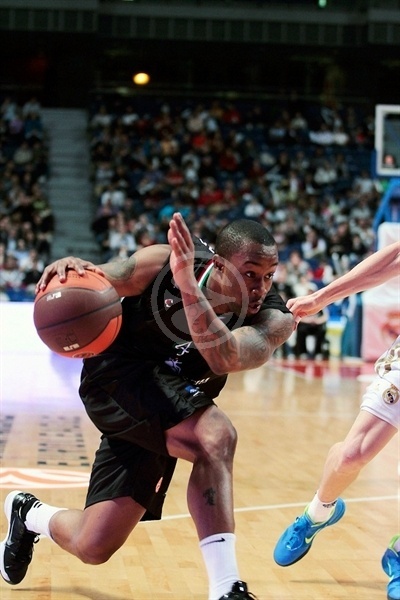 McCalebb took over with a fast break layup that forcing Madrid to call timeout, 60-72, with under 4 minutes to go. Llull split foul shots but McCalebb shock the crowd with a power basket. Free throws by Shaun Stonerook sealed the outcome, 61-76, but Madrid kept fighting for points differential. Andersen, McCalebb and Nikos Zisis stepped up to keep Montepaschi way ahead and make the guests cruise to a well-deserved, pivotal road win. "Congratulations to Montepaschi for a good win. At the beginning of the game we were soft and we missed some easy shots. There is no problem if you miss those, but there is a big one if the attitude towards the rebounds later is not the correct one. We managed to get to minus 10 later in the game but missed some more shots there and Siena could pull away again for good." "It was a great game for my team. We knew we had to be mentally ready to come to Madrid to play and we were, especially in the first quarter. We managed to score a lot then and we opened a hole in the score. Before the break Real Madrid managed to come closer but despite our nerves, we managed to pull away again." "We didn't defend well in this game and they controlled every aspect of the game. Montepaschi just didn't allow us to play our game. They are not a team known for their three-point shots, but tonight they shot a few and they went in." "It was a tough loss for us. We were too soft to face the game that Montepaschi brought here. We must step up in those situations. We started really bad in the first quarter and we cannot afford to repeat this performance." "Despite the big quality of Real Madrid we managed to stay cool in the third quarter when they managed to get closer. We kept our coolness and defended well in order to reject their comeback attempt." "It was a great win for us. It's important for our aspirations in this Top 16 group. We must manage this point differential we got here in Madrid in the next games, so we can stay at the top. We have to keep working like this. I don't care about my personal performance as long as the team wins. That's the only important thing."